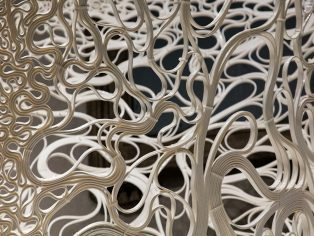 Named after the Greek word for flora that has no differentiation between stem and leaf, Thallus is an experimental structure investigating form and pattern generated by advanced manufacturing and computational methods. Created by automated additive manufacture as well as hot-wire cutting technology, the structure presents the on-going investigations into robotic assisted design undertaken by Zaha Hadid Architects’ Computational Design (ZHA CoDe) research group; demonstrating what can now be achieved in terms of mechanisation and customisation in the architecture, construction and engineering industries. 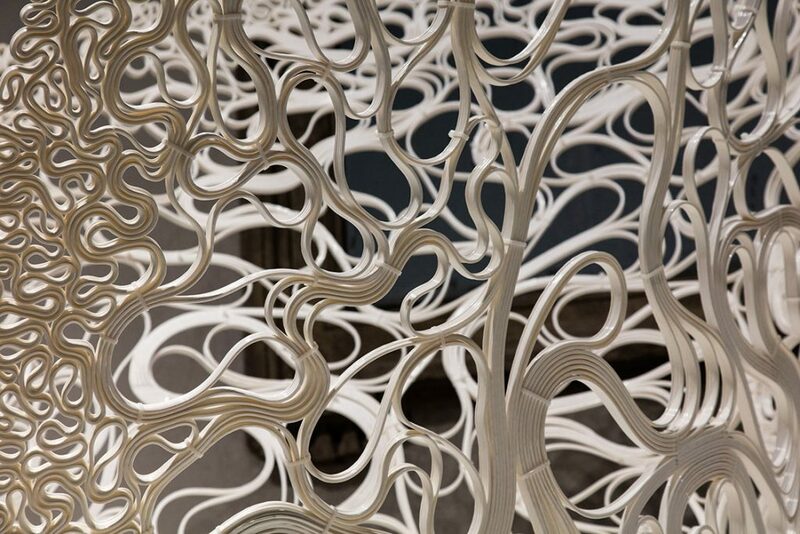 Six-axis robotic 3D printing technology created the 7km extruded structural strip as a continuous line that repeatedly loops to connect with itself on a ruled surface. Ruled surfaces are a class of surfaces generated by the movement of a straight line in space around an axis, and have been applied in the fabrication process of the piece. Its shape is tailored to a trimmed cylinder that enables a hot-wire cutting process to create the mould of the base on which the continuous structural strip has been robotically 3D printed. Thallus continues ZHA CoDe’s research into generating geometries through computation. The design explores differential growth methods through expansion and diffusion arising from a single continuous seed curve guided iteratively via simulation parameters while constrained to a reference surface. Density gradation and direction of growth have been defined by parameters such as proximity to boundaries, angled direction of rulings, as well as structural requirements.